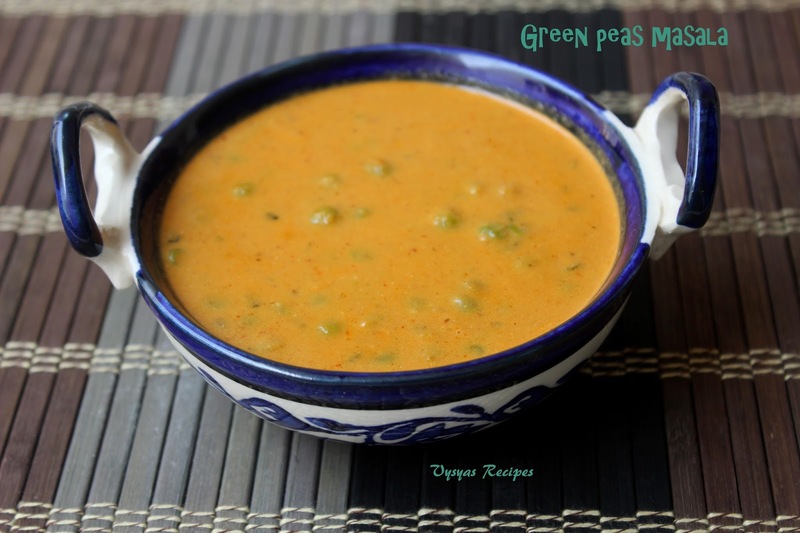 Green Peas Masala is a simple & Classic Gravy that goes well with chapathi,roti, Naan,Kulcha's,Phulka's,dosa's fried Rice & Jeera Rice.My daughter is a Great fan of this Gravy. Health benefits of Peas includes, fresh pea pods are considered as an excellent source of folic acidd.Peas are a low fat and a low calorie food type.They help in managing your weight effectively.They are rich sources of many minerals such as iron,calcium,zinc,copper,manganese etc which enhances the immune system of your body. Peas proteins enables blood sugar regulation in the body.Now we will learn to make the gravy. Pressure cook the peas for 2 whistles with 1 cup of water. Chop the onions & tomatoes. Finely chop the cashews. Heat the oil add onions, then add Ginger garlic paste, saute for 1 minutes. Then add cashews, saute till onions turns Golden brown. Then add tomatoes all spice powders, Chilli Powder ,Coriander powder,Cumin Powder, Turmeric Powder ,Garam Masala & salt. Saute till tomatoes turns mushy. Then switch off the flame. Once it Cools down grind it into a smooth paste with little water. Heat the oil, add butter & oil, add fennel seeds. When you get Good smell of fennel seeds add Ground Paste & cooked peas. Mix well. When it starts boiling add Garam Masala & rub kasthoori methi against your palms & add it. Add 1/2 cup of milk. Adjust water according to the consistency. Let it boil for 2 - 3 minutes in a medium flame, till it gets gravy Consistency. I used frozen peas, you can use fresh or dry Peas. if using dry peas soak for 8 hrs or overnight. 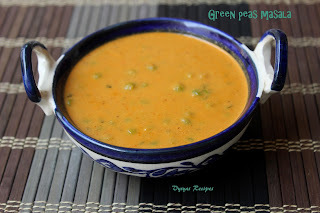 Alternatively,if using fresh or frozen Peas, you can cook the Peas in kadai, with needed water, till it turns soft. Always saute onions till it turns, Golden brown & tomatoes turns Mushy for Good results. Adding Kasthoori Methi enhances the flavour of Masala. Adding cashews gives creamy texture to Gravy. Another fav dish in my house as well, oh-so-loved the tastes. Perfect and amazingly delicious recipe. YUMMY! Mouth watering gravy curry, a perfect side dish for chapathi, prata, dosa etc...love it! Love how rich and classic this peas gravy sounds. YUMMY!